GASP! 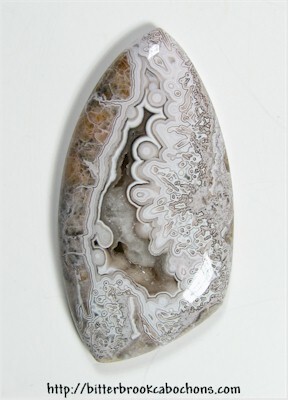 This is one of the most awesome looking chunks of Lace Agate I've ever seen! It's a gigantic piece of lace and Drusy, cut in a bold projectile shape. The huge Drusy canyon is open only at the top and bottom (the darker-appearing areas). This cab's so pretty, you'll want to slap your Granny! 54mm x 28mm x 6.5mm. Weight: 74.05 carats.